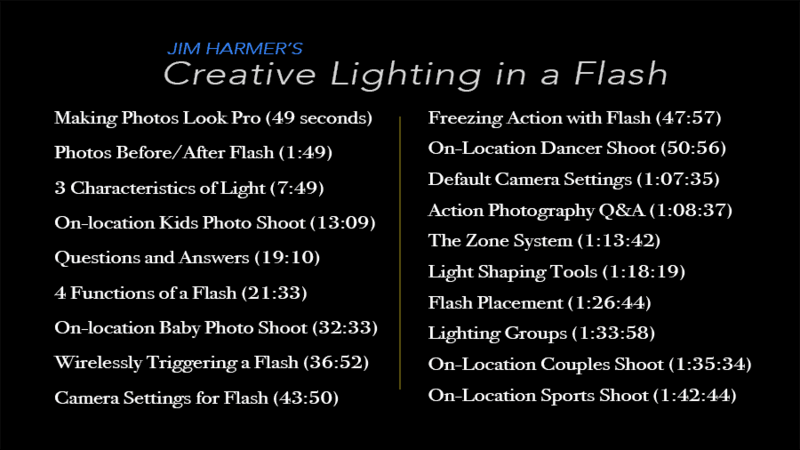 Jim Harmer's Lighting in a Flash is the ultimate video workshop for photographers who want to learn to control the lighting in their portraits, create amazing conceptual portraits ANYWHERE, and learn how to use two simple light modifiers to recreate most any lighting setup. But any Youtube video can teach you how to use a speedlight. Lighting in a Flash takes flash photography much further–bringing you on location to multiple creative shoots with Jim so you can see step-by-step how to create jaw-dropping and creative portraits with minimal gear. Each lesson teaches you a new technique, with many videos filmed on-location so you can see exactly how to sculpt the lighting in any situation. If for any reason you aren't 100% satisfied with your purchase, email us and we'll refund your money within 30 days. The videos are yours to stream or download and keep forever. Watch them on any device, as often as you like, for years to come. After teaching thousands of photographers how to use flash photography, Jim has boiled down what he usually spends a few weeks teaching in online classes into a single video production. You'll learn all the foundations you need to use a flash–even if you've never touched one before. You'll learn the three characteristics of light, how to work with a flash sync speed, why buying a flash with ETTL is usually a waste of money, and how to get the brightness of the flash right every single time–without a flash meter! You'll also learn the default camera settings that Jim uses almost every time he takes a flash photo. Jim shows you how he creates 5 professional portraits using no models. He photographs his wife, his kids, a dancer, a friend's baby, and the neighbor kid who plays sports in school. Even with no professional models and only using bare bones, inexpensive gear, Jim shows you how you can make incredible portraits. The zone system is one of the most important flash photography techniques a photographer can learn, but most photographers never learn this forgotten technique. If you don't feel like you can control the specific brightness of different areas of the frame, this lesson will really help. Getting great results with a flash is not all about the gear, which is why Jim goes through this entire training only using two light modifiers and a cheap $70 flash. But knowing the right gear to buy can save you hundreds of dollars. Learn what gear Jim uses to get high-end looks on the cheap. Most photographers can pull off a simple fill flash by putting it on the camera to fill in shadows. But freezing motion with flash in low light situations is a much tougher task–until now. You'll see how to freeze the action in ANY lighting situation. All of this is included in Lighting in a Flash, and more! Jim Harmer is one of the most popular photographers online, with over a million followers on social media. 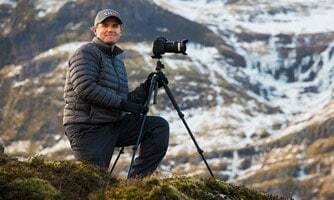 He travels the world holding his completely-free photography workshops with his readers across the globe and hosts the Improve Photography Podcast each week. His photographs have been purchased by private art buyers as well as large publications such as Shutterbug Magazine, Time, Readers Digest, and Nikon. Jim is well known for his easy-to-understand and down-to-earth teaching style. View Jim Harmer's Portfolio here.